Congress is rattling its saber at colleges and universities with endowments worth U$1 billion or more. Committees from the House and Senate have sent a joint letter to 56 private colleges and universities, asking for comprehensive information about endowment spending and management policies. Thomas W. Reed, representative for New York’s 23rd Congressional District, is talking about legislation that would require colleges and universities with endowments of $1 billion or more to spend 25 percent of their endowment earnings on financial aid or forfeit their tax-exempt status. But what is so significant about the $1 billion mark? Are all endowments with $1 billion so huge that Congress should treat them differently than endowments with less than $1 billion? And are all endowments less than $1 billion so small that Congress should ignore them? From my perspective as a professor who has studied endowments, the only real significance of $1 billion is that it shocks the public because it sounds like so much money. What really matters is how much buying power a school needs and how much buying power an endowment has. The bigger a school’s budget, the more endowment is necessary. To figure out which colleges and universities have large endowments, you have to consider a school’s expenses. An endowment is like a savings account that exists to support college or university operations. The assets in an endowment usually come from donations. The funds in an endowment are invested; each year a school spends a portion of these returns and then puts the remainder back into the endowment. In good financial times, an endowment allows a school to spend more on priorities like financial aid, research budgets or professor salaries. In bad financial times, an endowment acts like a rainy day fund to ensure that schools will not have to dramatically reduce spending in important areas. Because an endowment’s primary purpose is to support institutional operations, the strength of a $1 billion endowment is relative to the size of an institution’s expenses. To illustrate, I want to take a closer look at three of the schools that received the congressional request for information because they have endowments of $1 billion or more. In the context of this discussion, there’s nothing particularly special about these three schools except that they demonstrate why expenses are relevant to endowment size. Each year, the National Association of College and University Business Officers ranks endowments by their absolute value. In 2015, Harvard was at the top of the heap with an eye-popping $36.4 billion endowment. Vanderbilt University was in 23rd place, with $4.1 billion. Grinnell College was considerably farther back, coming in 50th with an endowment of almost $1.8 billion. Now let’s add a fourth school to the mix: Colgate University. As before, in the context of this discussion there’s nothing special about Colgate except that it helps illustrate why endowments and expenses need to be considered simultaneously. When measured only by absolute endowment value, Colgate is way behind Harvard, Vanderbilt and Grinnell. Colgate comes in 103rd place, with an $892 million endowment. And Colgate was spared the congressional letter because its endowment did not exceed the $1 billion threshold. Now consider these same schools, this time in light of both absolute endowment value and all expenses – the costs incurred to fulfill the school’s educational mission, to administer the institution and to fundraise. Unsurprisingly, these four schools have wildly different expenses. Harvard and Vanderbilt are large research universities, while Grinnell and Colgate are small liberal arts colleges. In 2013 (the most recent year for which data is readily available), Harvard had expenses of $4.4 billion; Vanderbilt, $3.8 billion; Grinnell, $97.6 million; and Colgate, $172.2 million. There’s been a lot of discussion about whether colleges and universities are doing enough to control costs. But to measure the strength of an endowment, we can assume that current institutional expenses are representative of future institutional expenses. Grinnell’s endowment is so enormous that it can pay for a whopping 18 years of expenses, until today’s infants are ready to matriculate. 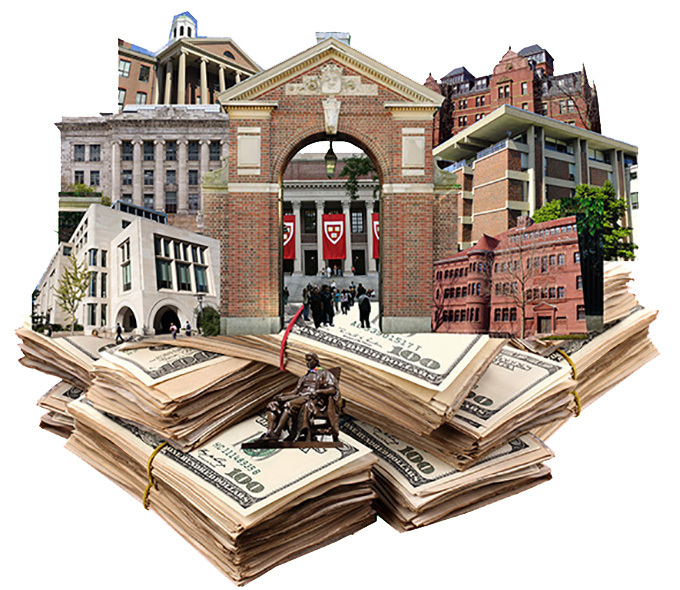 Harvard’s endowment is large enough to cover eight years. And Colgate – which does not exceed the $1 billion threshold – can pay for five years. But Vanderbilt, with its $4.1 billion endowment, cannot cover even two years’ worth of expenses. Some academics have argued that endowments are excessively large once the endowment can cover more than two years of expenses. Others have suggested that an endowment is much bigger than a school needs when it can pay for more than five years of expenses. At some point, an endowment may become vastly larger than what a college or university needs to ensure its success. No school really needs an endowment that is large enough to cover a half-decade or more of expenses. But to determine whether an endowment is so large that it warrants different treatment than others, Congress must consider the endowment in relation to institutional costs. It cannot simply use $1 billion as some kind of magical threshold. Favorable tax policy is one of the reasons that endowments can accumulate $1 billion or that a school can have an endowment large enough to cover 18 years of expenses. The government collects fewer tax dollars than it otherwise would because donations to endowments qualify for the charitable deduction, and endowments do not have to pay taxes on their investment returns. In my view, schools like Harvard and Grinnell are going to fight tooth and nail to hang on to this preferential tax treatment. But when a college or university has an endowment that is large enough to cover its expenses for years and years into the future, I believe lawmakers should conclude that the forgone tax dollars would be better spent elsewhere. At some point, an endowment has such ample funds that it no longer needs government subsidy. This means goodbye to tax-free investment returns and to the charitable deduction. Eliminating the charitable deduction may mean that donors would give less, but they would not stop giving altogether. As I’ve described elsewhere, research has shown that the charitable deduction is only one of the reasons that donors give to colleges and universities. Some donors feel a responsibility to “give back” to their alma matter. Others desire the social status and public recognition that giving can provide, or want to influence institutional policy. Some people give simply because it makes them feel good. For many donors, a combination of all these factors motivates them to give. But even if eliminating the charitable deduction means that some donors would choose to direct their giving elsewhere, chances are that the recipient organization would need the donation more than a school with a very large endowment. Although schools are unlikely to see it this way, less preferential tax treatment would actually be a sign of success: it means that donors have been so generous and the endowment has been so well-managed that the school now requires less public assistance than others do. So, legislators should stop fixating on the $1 billion mark and instead evaluate endowments in their larger institutional context. Before Congress singles out certain endowments for less preferential tax treatment, it needs to distinguish between endowments that sound obscenely large and those that actually are.